Despite a rainy start to the day, five of us turned out for our hike around Kettle Pond in Groton State Forest. Seven others cancelled due to the weather. However the day cleared for views of fall foliage reflecting in the water and loons spending their final days here before migration. 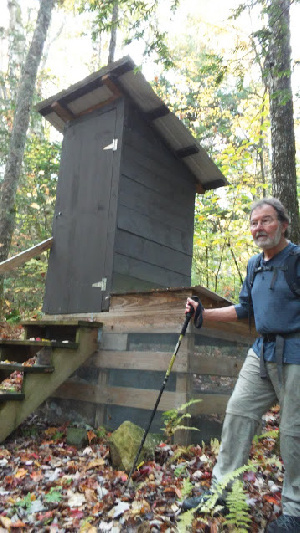 We were impressed by the improvements Vermont Forests and Parks has made to the remote sites. The historic CCC shelter at the Marshfield end of the pond, where we had lunch, has been restored and has a state-of-the-art moldering privy, as does each of the remote sites. The trail has been rerouted so it no longer crosses directly in front of each shelter. 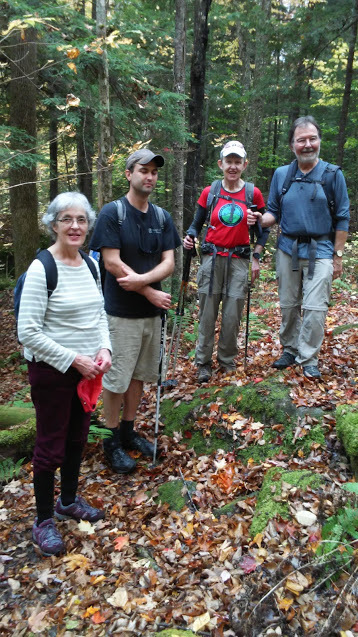 One of our hikers, Jill's cousin Anthea, who's visiting from Cumbria County in the Lakes District of England, enjoyed learning about our woods and the history of Groton Forest.